With only 8 points dividing the top three drivers, the 2nd season of 2008 Carlsbad Challenge GP ended in a close race for the championship. 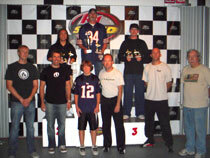 With 52 Points, Bill Groves took the championship trophy and prize package home. Though he finished second in the final main of the year, his consistent performance throughout the season gave him enough to take the 1st place podium position. Close behind was John Tanaka in 2ndplace, Paul Ciralli in 3rd with Brad Harvey and Stephen Robertson rounding out the 4th and 5th positions. You can see all Carlsbad Challenge GP Results Here and keep a look out for the new dates to start the first season of 2009. See you at the track.